Novel Sheds Light on Frank Lloyd Wright's Mistress In 1909, Frank Lloyd Wright, a married father, ran off to Germany with a neighbor, the wife of a client. A new novel imagines a scandalous and little-known part of the legendary American architect's history. 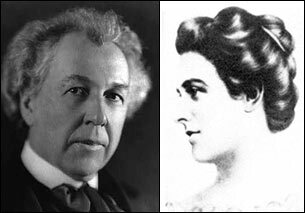 Frank Lloyd Wright (left) and Mamah Borthwick Cheney created a scandal when they ran off together. 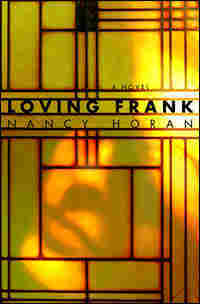 Loving Frank is writer and journalist Nancy Horan's first novel. Frank Lloyd Wright, the legendary American architect, had a long and remarkable life. He was 92 when he died in 1959. By then, he had stamped an original style on buildings, and had been lauded and vilified — often in equal amounts. A new novel imagines a scandalous and little-known part of Wright's history. In 1909, Wright of Oak Park, Ill., married, with children, ran off to Germany with a neighbor — Mamah (pronounced "May-mah") Borthwick Cheney, the wife of a client. Mamah and her husband Edwin Cheney had two young children. She abandoned them all, for Wright. 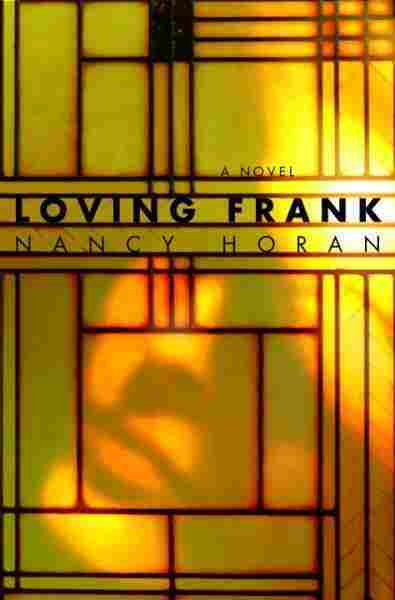 "I think what [Wright] saw in Mamah was a very attractive woman, a woman with a great deal to say — curious about the world in the way he was," says author Nancy Horan, who chronicles the real-life love affair in a book called Loving Frank. Mamah became intrigued, then obsessed, with a man who was re-inventing architecture. "I'd like to have architecture that belonged where you see it standing and was a grace to the landscape instead of a disgrace," Wright once said. Horan says that Wright "wanted to create an architecture that was true — something that emerged like a plant from the earth. He was bent on cutting his connections to the past that belonged to somebody else." He spoke about working "true" and did that at his drawing board. 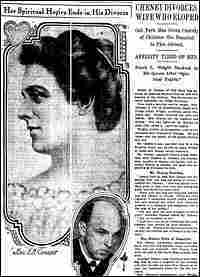 But Horan says that Wright felt he wasn't living true in his marriage. And so he fled with Mamah. It was a scandal — especially for a proper turn-of-the-20th-century woman. 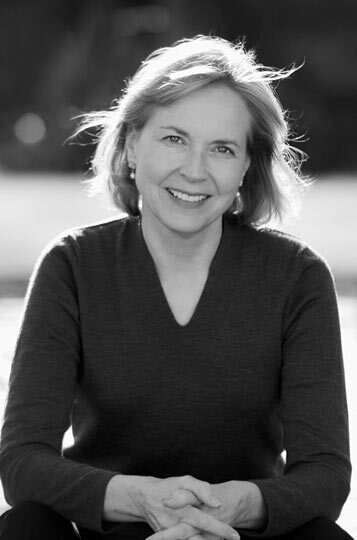 In the novel, Cheney tells herself that leaving her husband and children for Wright was an act of love for life. "I think Mamah Cheney was a woman who had a hole in her soul," Horan says. "She was a woman who had unrealized potential that she wanted to explore and experience." Highly educated, fluent in several languages, Mamah longed for more in life. To her, "more" looked a lot like Frank Lloyd Wright. But the two paid a terrible price for their passion and individualism. "It ruined Frank Lloyd Wright's practice for many years afterwards," Horan says. "It ruined Mamah's reputation." The ending, in 1914, was tragic — wrapped in destruction. To say more would give away an amazing story. "I think Mamah was a flawed person. You can certainly view what she did as a selfish act. 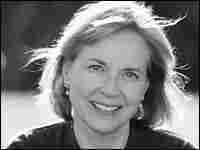 You can also view it, however, as a form of self-preservation in terms of what she needed to do for herself." Terms like selfish and self-preserving apply as well to Wright. He was also known as a genius, of course, but also an arrogant narcissist. "He viewed himself in a sense as a prophet, and a person who had gifts that other people didn't have," Horan says. The author says her work of fiction was influenced by John Lloyd Wright's biography of his father, which showed another side of the famous architect. "It was really his words that kind of gave me permission to imagine Frank as something more than a colossal egotist," Horan says. "And what he said about Mamah and about his father was that something in him died with her — a something that was loveable and gentle that I knew and loved in my father." Mamah Cheney sidled up to the Studebaker and put her hand sideways on the crank. She had started the thing a hundred times before, but she still heard Edwin's words whenever she grabbed on to the handle. Leave your thumb out. If you don't, the crank can fly back and take your thumb right off. She churned with a fury now, but no sputter came from beneath the car's hood. Crunching across old snow to the driver's side, she checked the throttle and ignition, then returned to the handle and cranked again. Still nothing. A few teasing snowflakes floated under her hat rim and onto her face. She studied the sky, then set out from her house on foot toward the library. It was a bitterly cold end-of-March day, and Chicago Avenue was a river of frozen slush. Mamah navigated her way through steaming horse droppings, the hem of her black coat lifted high. Three blocks west, at Oak Park Avenue, she leaped onto the wooden sidewalk and hurried south as the wet snow grew dense. By the time she reached the library, her toes were frozen stumps, and her coat was nearly white. She raced up the steps, then stopped at the door of the lecture hall to catch her breath. Inside, a crowd of women listened intently as the president of the Nineteenth Century Woman's Club read her introduction. "Is there a woman among us who is not confronted—almost daily—by some choice regarding how to ornament her home?" The president looked over her spectacles at the audience. "Or, dare I say, herself?" Still panting, Mamah slipped into a seat in the last row and flung off her coat. All around her, the faint smell of camphor fumes wafted from wet furs slung across chair backs. "Our guest speaker today needs no introduction . . ."
Mamah was aware, then, of a hush spreading from the back rows forward as a figure, his black cape whipping like a sail, dashed up the middle aisle. She saw him toss the cape first, then his wide-brimmed hat, onto a chair beside the lectern. "Modern ornamentation is a burlesque of the beautiful, as pitiful as it is costly." Frank Lloyd Wright's voice echoed through the cavernous hall. Mamah craned her neck, trying to see around and above the hats in front of her that bobbed like cakes on platters. Impulsively, she stuffed her coat beneath her bottom to get a better view. "The measure of a man's culture is the measure of his appreciation," he said. "We are ourselves what we appreciate and no more." She could see that there was something different about him. His hair was shorter. Had he lost weight? She studied the narrow belted waist of his Norfolk jacket. No, he looked healthy, as always. His eyes were merry in his grave, boyish face. "We are living today encrusted with dead things," he was saying, "forms from which the soul is gone. And we are devoted to them, trying to get joy out of them, trying to believe them still potent." Frank stepped down from the platform and stood close to the front row. His hands were open and moving now, his voice so gentle he might have been speaking to a crowd of children. She knew the message so well. He had spoken nearly the same words to her when she first met him at his studio. Ornament is not about prettifying the outside of something, he was saying. It should possess "fitness, proportion, harmony, the result of all of which is repose." The word "repose" floated in the air as Frank looked around at the women. He seemed to be taking measure of them, as a preacher might. "Birds and flowers on hats . . ." he continued. Mamah felt a kind of guilty pleasure when she realized that he was pressing on with the point. He was going to punish them for their bad taste before he saved them. Her eyes darted around at the plumes and bows bobbing in front of her, then rested on one ersatz bluebird clinging to a hatband. She leaned sideways, trying to see the faces of the women in front of her. She heard Frank say "imitation" and "counterfeit" before silence fell once again. A radiator rattled. Someone coughed. Then a pair of hands began clapping, and in a moment a hundred others joined in until applause thundered against the walls. Mamah choked back a laugh. Frank Lloyd Wright was converting them—almost to the woman—before her very eyes. For all she knew five minutes ago, they could just as well have booed. Now the room had the feeling of a revival tent. They were getting his religion, throwing away their crutches. Every one of them thought his disparaging remarks were aimed at someone else. She imagined the women racing home to strip their overstuffed armchairs of antimacassars and to fill vases with whatever dead weeds they could find still poking up through the snow. Mamah stood. She moved slowly as she bundled up in her coat, slid on the tight kid gloves, tucked strands of wavy dark hair under her damp felt hat. She had a clear view of Frank beaming at the audience. She lingered there in the last row, blood pulsing in her neck, all the while watching his eyes, watching to see if they would meet hers. She smiled broadly and thought she saw a glimmer of recognition, a softening around his mouth, but the next moment doubted she had seen it at all. Frank was gesturing to the front row, and the familiar red hair of Catherine Wright emerged from the audience. Catherine walked to the front and stood beside her husband, her freckled face glowing. His arm was around her back. Mamah sank down in her chair. Heat filled up the inside of her coat. On her other side, an old woman rose from her seat. "Claptrap," she muttered, pushing past Mamah's knees. "Just another little man in a big hat." Minutes later, out in the hallway, a cluster of women surrounded Frank. Mamah moved slowly with the crowd as people shuffled toward the staircase. "May-mah!" he called when he spotted her. He pushed his way over to where she stood. "How are you, my friend?" He grasped her right hand, gently pulled her out of the crowd into a corner. "We've meant to call you," she said. "Edwin keeps asking when we're going to start that garage." His eyes passed over her face. "Will you be home tomorrow? Say eleven?" "I will. Unfortunately, Ed's not going to be there. But you and I can talk about it." A smile broke across his face. She felt his hands squeeze down on hers. "I've missed our talks," he said softly. She lowered her eyes. "So have I." ON HER WALK HOME, the snow stopped. She paused on the sidewalk to look at her house. Tiny iridescent squares in the stained-glass windows glinted back the late-afternoon sun. She remembered standing in this very spot three years ago, during an open house she and Ed had given after they'd moved in. Women had been sitting along the terrace wall, gazing out toward the street, calling to their children, their faces lit like a row of moons. It had struck Mamah then that her low-slung house looked as small as a raft beside the steamerlike Victorian next door. But what a spectacular raft, with the "Maple Leaf Rag" drifting out of its front doors, and people draped along its edges. Edwin had noticed her standing on the sidewalk and come to put his arm around her. "We got ourselves a good times house, didn't we?" he'd said. His face was beaming that day, so full of pride and the excitement of a new beginning. For Mamah, though, the housewarming had felt like the end of something extraordinary. "OUT WALKING IN a snowstorm, were you?" Their nanny's voice stirred Mamah, who lay on the living room sofa, her feet propped on the rolled arm. "I know, Louise, I know," she mumbled. "Do you want a toddy for the cold you're about to get?" "I'll take it. Where is John?" "Next door with Ellis. I'll get him home." "Send him in to me when he's back. And turn on the lights, will you, please?" Louise was heavy and slow, though she wasn't much older than Mamah. She had been with them since John was a year old—a childless Irish nurse born to mother children. She switched on the stained-glass sconces and lumbered out. When she closed her eyes again, Mamah winced at the image of herself a few hours earlier. She had behaved like a madwoman, cranking the car until her arm ached, then racing on foot through snow and ice to get a glimpse of Frank, as if she had no choice. Once, when Edwin was teaching her how to start the car, he had told her about a fellow who leaned in too close. The man was smashed in the jaw by the crank and died later from infection. Mamah sat up abruptly and shook her head as if she had water in an ear. In the morning I'll call Frank to cancel. Within moments, though, she was laughing at herself. Good Lord. It's only a garage. Excerpted from Loving Frank by Nancy Horan. Excerpted by permission of Ballantine Books, a division of Random House, Inc. All rights reserved. No part of this excerpt may be reproduced or reprinted without permission in writing from the publisher.